Please join us in the Caesar Rodney Family Literacy Program. Adults can learn to speak or improve their English skills. There is also a free family literacy program for children who are 2 to 12 years old. To learn more or to register, please click the link below for more information. If parents have a concern about potential bullying to pleace contact our school office at 674-9080. To view our school's Bully Prevention Policy, reference the Student Handbook under the student tab, Section Y: Bully Prevention and Cyberbullying, pages 28-32. Meet or exceed the annual ESEA targets in all cells in the school accountability system. Maintain a safe environment in an atmosphere of caring discipline. Provide opportunities that encourage a partnership of families, district staff members, students and the community. Project revenue resources to maintain the strong financial position necessary to support the needs of the district. 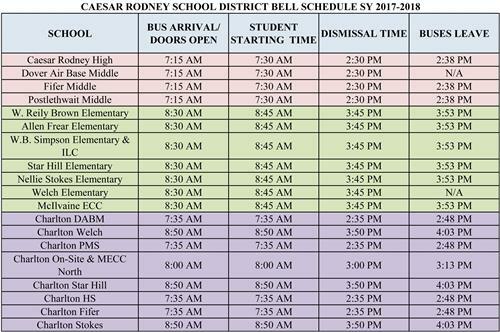 Coordinate the district’s resources and create a plan that aims to ensure all students enrolled in the Caesar Rodney School District for three or more consecutive years will perform at or above grade level by the end of the student’s third year of enrollment.